THIS DRESS IS NOW IN PRODUCTION IN A PENCIL CUT AFTER BEING VOTED IN BY THE MAJORITY OF YOU! This dress has been named the Miranda dress after customer Miranda Hershey suggested the design was changed to a pencil cut style. Her suggestion was voted IN by 70% of you via our newsletter campaign. It will also be produced in a purple shade. 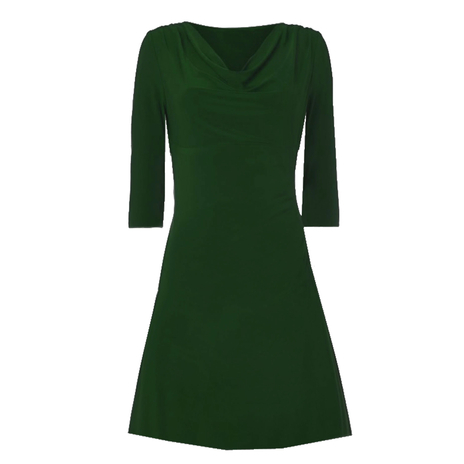 Miranda gets this green dress free as a reward for having the most popular design suggestion. If you were a fan of the original A-line style but forgot to vote, now you know you should have used your vote to ensure you have a voice in fashion. Don't worry, drop us an email at info@jeetly.com and we will accommodate your request in a sample for the next collection. Petite ladies, remember EVERY vote counts, you're re-inventing PETITE FASHION! Machine washable at 40 degrees although best washed at 30. COMMENTS : Very elegant and timeless. Bottle green is one of my favourite colours so I would definitely buy this. COMMENTS : Are the sleeves 3/4 length? If so I would have this so I can wear all year round, love the neck detail. COMMENTS : A flattering cut, high neck and lovely colour. If the quality of previous dresses is anything to go by, then would definitely buy. COMMENTS : Flowing fabric in this green is the perfect dress that can be worn from day into evening....just add an emrald and gold long necklace with matching earrings and a matching pair of heels. COMMENTS : The color is nice but I don't like the style. I'm not really sure but it appears to be an old style. COMMENTS : Timeless design. With the right accessories it can be either classic or more fun. COMMENTS : Really like this! I'd prefer olive green rather bottle green, but would buy either way! COMMENTS : I love the design but would love this in a deep red or maroon colour. COMMENTS : The neck detail is awesome for me and the quality has a perfect look. COMMENTS : The color is really elegant but I prefer the style to be a pencil cut to makes it look more classic and powerful for petites. COMMENTS : I agree, this dress would be worth a buy in a fitted pencil style-great value and style. COMMENTS : I love the neckline. It is difficult to find pretty dresses with long (or 3/4) sleeves.